If you are looking for a unique Southern gift for your friends, father, mother, sister, brother, son, daughter, husband or wife, you have found it! Dixie gift baskets are wonderful for birthdays, teenagers gift, Christmas or Holiday gift, Mother’s day, Father’s day, anniversary, wedding, shower, secretaries day, housewarming gift, or virtually any special day or when you need a humorous gag gift to present to either your politically incorrect buddies or the politically correct types who need a Rebel Gift Basket to point them in the right direction. 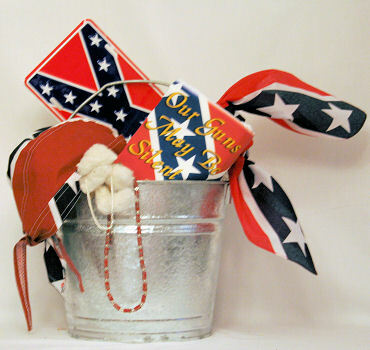 Our gift baskets are actually quality 12 quart galvanized pails chock full of Rebel items. We have the right stuff for the Rebel in your life! Every season is the perfect one for a Southern style gift basket. Our Southern Belle basket is made with plenty of Southern charm to delight girls and ladies from anywhere. You don't need to be a Son of a Confederate Veteran to enjoy giving or getting our unique Southern Heritage Gift baskets for any occasion. If you are looking for a truly unique gift, it is here. We serve all cities and states from Atlanta GA, Boston MA, Dallas Tx, Denver CO, Houston TX, Los Angeles CA, Seattle WA, San Diego CA, New York City to Miami FL, and Alabama, Alaska, Arizona, Arkansas, California, Colorado, Connecticut, DC, Delaware, Florida, Georgia, Hawaii, Illinois, Idaho, Iowa, Indiana, Kansas, Kentucky, Louisiana, _tope, Maryland, Massachusetts, Michigan, Minnesota, Mississippi, Missouri, Montana, Nebraska, Nevada, New Hampshire, New Jersey, New Mexico, New York, North Carolina, North Dakota, Ohio, Oklahoma, Oregon, Pennsylvania, Rhode Island, South Carolina, South Dakota, Texas, Occupied Texas, Tennessee, Utah, Vermont, Virginia, Washington, West Virginia, Wisconsin, Wyoming, and Puerto Rico. We accept credit cards, bank transfers, debit cards, and PayPal.